Many players don’t realize this. They think that speculation is just a game that people play and drives up prices. Only “those people” can make money as the market is too complex. 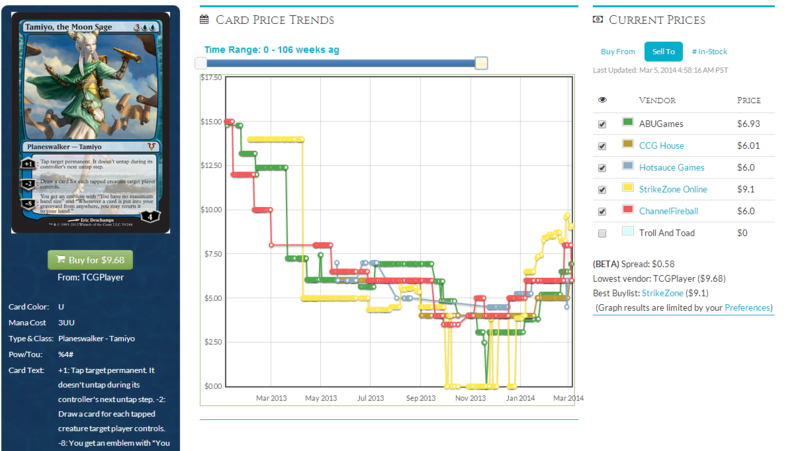 In actuality, understanding the card price market is much simpler, and more important, to the average player. Few of us are millionaires or billionaires. Even if you are, there’s still an incentive to saving money. It’s not that hard to save money on this game. The fact is that most people are too lazy. Here are three tips for saving money as a regular player of Magic. This is one of the most important methods. Especially for an occasional PTQ or GP player, you need to plan out your needs in advance in order to save the most money? Magic is a cyclical game. PTQ season rotates. Standard begins and ends. New sets are added. It’s quite easy to predict where cards will go. For example, let’s examine the summer PTQ season. If you want to play Modern during PTQ season, there’s never going to be a better time to buy the expensive staples for your deck than the next two months. The only way they are going into the summer is up as everyone will want to buy Modern cards around the summer. Because YOU anticipated YOUR needs, you are already set up for the most expensive cards and probably saved around 100 dollars on that deck. That’s food for a week. One way to keep track of this is to track the staples that you are hoping to pick up using the wishlist module on mtgprice.com. One of the great things about this feature is that you can see if the cards you are watching have gone down or up. If they dip a little bit, buy in, and you have just saved yourself potentially quite a bit of money. You have to see what your Magic game is going to be looking like in 3 months. If you are going to be playing Modern in 3 months, you have to be cognizant of that and act upon it. Don’t wait. Another example is rotation. Often, people who are playing standard forget to sell or buylist their cards until a month before rotation. This is lazy and a waste of money. If you are going to be participating in Modern PTQs anyways, forgo the 500 dollar Standard deck and play something budget at FNMs. If you sell off your expensive rotating staples before everyone else decides to, you’ll be in great shape, and potentially save hundreds here again. Inventory data is amazing here. 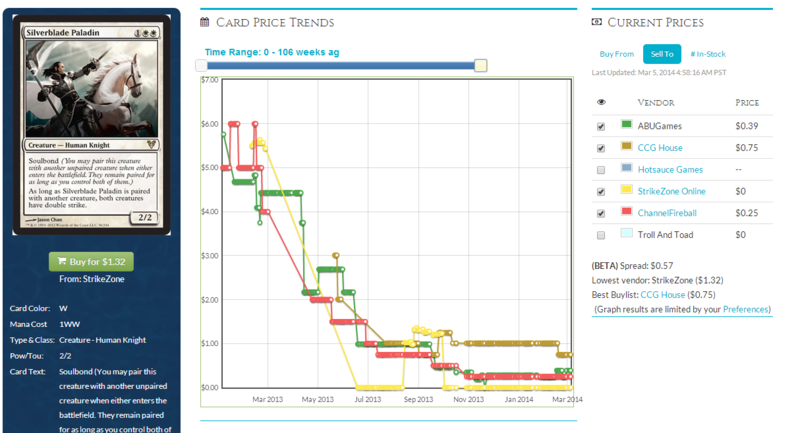 Card shops can’t react quickly enough to dramatic shifts in inventory. This is where protrader comes in. The emails you get EVERY DAY from protrader show you cards that are being bought out. You can jump on that bandwagon if you see a card that was bought out that you want to play in the future. Otherwise, you would have missed that opportunity. 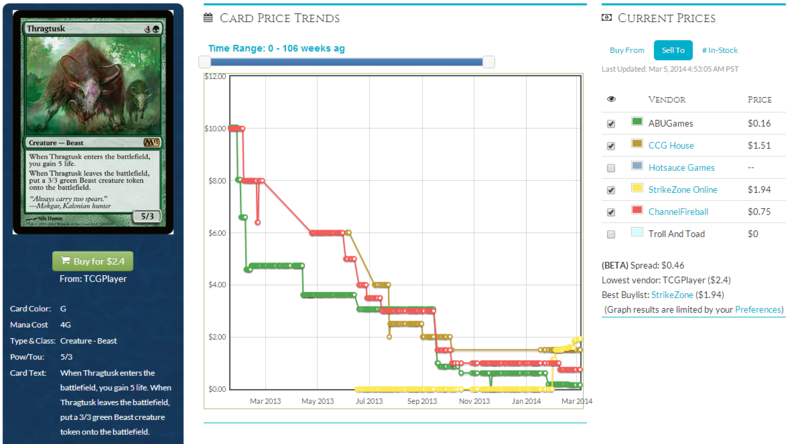 If you have a large collection, the mtgprice collections feature is invaluable. Spend a day organizing your rares and inputting them into the collections feature. 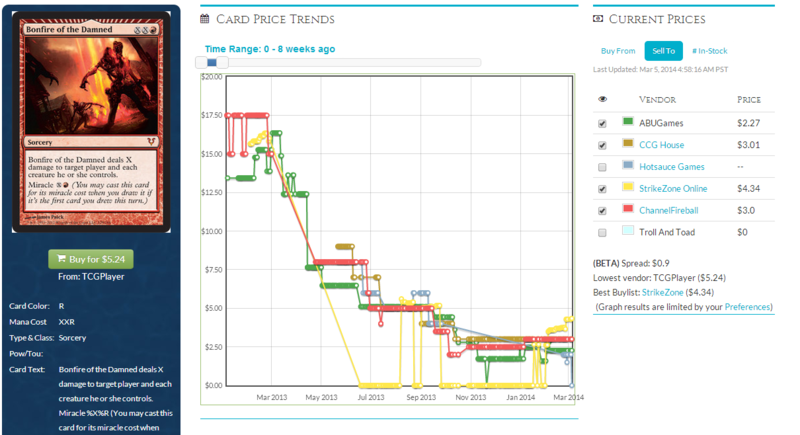 Not only does this give you pricing data, but you can see where your cards have moved in price in the past few days. I know Magic players who have binders and binders full of cards. 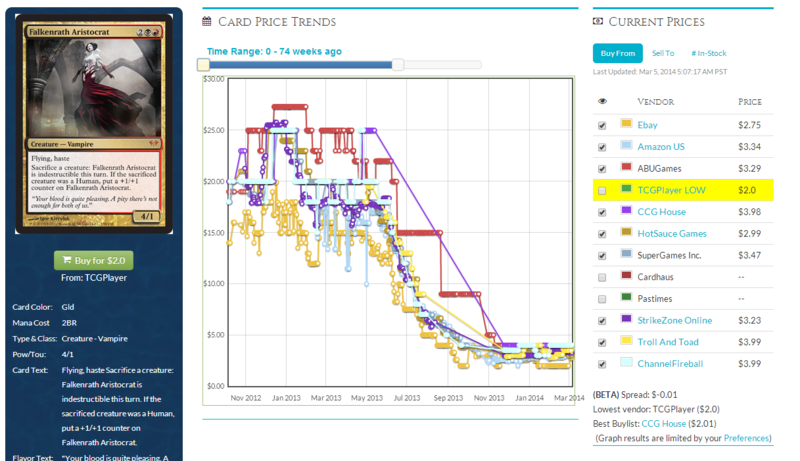 If you just put them into the system, you can see when the prices of those cards goes up and you can cash in! A lot of times, you aren’t and will never play with these cards again. Other than collecting dust, you can turn these into cash or store credit. Let’s say you had a playset of Restoration Angels in a trade binder. 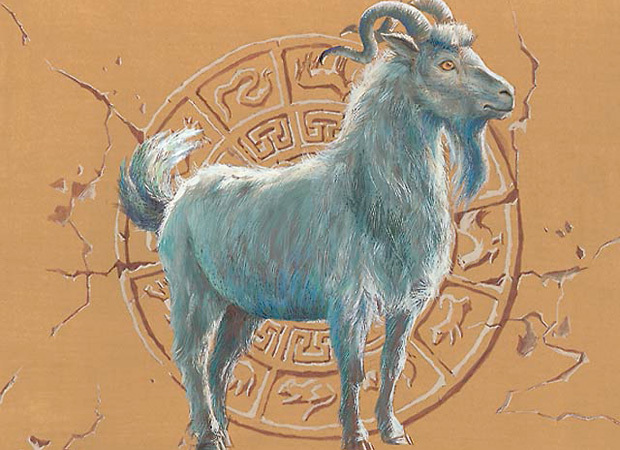 Nobody at your LGS really wanted them; few of them play Modern outside of PTQ season. You catalog them in your collection on mtgprice. Suddenly, you notice the price of the Angel creep up…and up. You would then be in a great position to buylist them and make a not-small sum of money. When organizing, we sometimes overlook cards that have immense value as casual staples. Who would have thought that Helix Pinnacle is a 6 dollar card? Even if you were just organizing your trade binder, you would look over tons of cards that potentially have some value. If your cards are in the system you can see what price they are going for and buylist the ones you will never use again. That is smart. That’s not just saving money. That’s making money you otherwise would not have had. This also figures into rotation. You can find the optimal time to liquidate your standard staples before they rotate and before they lose buylist value. How about a journey back to the time of the tusk? Standard staples are already going to be on their buylist descent, especially if their playability is only in one format. Another good card to evaluate is Falkenrath Aristocrat. Played in the Aristocrats deck, it had little playability outside of Standard. As you can see, the latest you could get out was around June. Let’s keep investigating. This one was falling in buylist right around now! That’s insane. This one had lots of playability in various aggro decks, but it too fell victim. This one was played in control decks. Ominously, it decreased significantly…starting around now. And Bonfire decreased starting now. These are undeniable realities-the window for selling these for max price before rotation is slipping. You need to get out soon, the longer you wait, the less you get. But, how about lands? 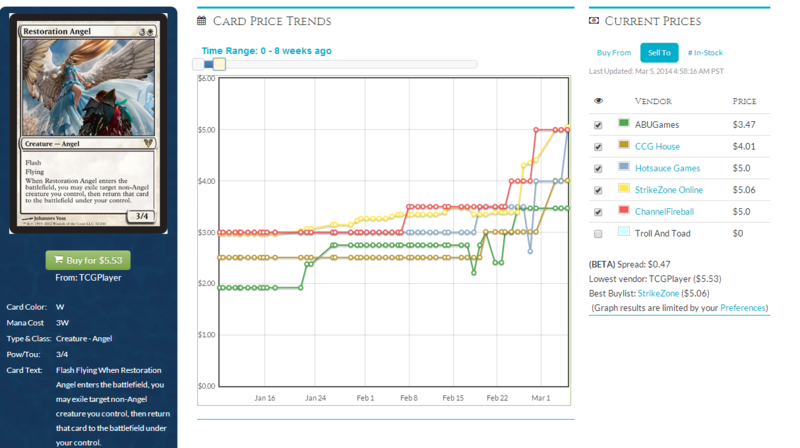 I don’t think the RTR lands will decrease all that much going into the summer. Their playability in Modern will keep them afloat. If anything, they’ll be double their current price in a year. I would hold. As a player, it’s easy to get swept into the vortex of making big bucks by buying Magic cards. It is possible. It is not easy or for the faint of heart. If you are sick of speculation and don’t want to be a part of the game, I understand. That doesn’t mean you can’t focus on the things that will save you money as a player. One of those is buying into the future standard staples while they are cheap. Did anyone really think that Restoration Angel wasn’t going to be an important card just because the Delver staples were cycling? How about Snapcaster Mage? Geist of Saint Traft? Huntmaster? It’s about becoming aware of these realities when everyone has sold or held out on cards that are not even rotating! It’s about saving money and paying half what you would have had to pay in 6 months. If you’re an average player, you don’t have time to predict every run up. You can, however, follow Sigmund or Jason or any of the other personalities in the mtgfinance community (or me) to see what the general themes and feelings are about cards. Above all, you need to use your instincts as a player and mold them in a way that allows you to save money and play at the same time. What are my long term picks? This is an amazing card and hilariously undervalued. Any control deck will want this, and any midrange deck will want to side this in against control decks. Moreover, cards like this have nearly zero risk into the long term. This might as well have Commander stapled onto it. It’s flavorful, fun to play with and wins the game by itself. There was some movement on it but it’s still quite low. Move in. I have heard the Brainstorm Brewery guys talk about this one a lot before the previous rotation. It has not had any time in standard but it’s got casual long term appeal. I’m a buyer of foils or as throw-ins in trade. Commander card. Wait for it to drop to a dollar around rotation, pick it up, let it sit in a box for a year. It’ll be five dollars before you know it (keep track using the collection feature). That about does it. Follow me on Twitter (http://twitter.com/camdenclarkmtg), I’d love to chat. If you want me to write an article about something, feel free to hit me up.